CANNON BALL, N.D. -- A Northern California-based journalist and activist captured the moment she was shot by a rubber bullet while covering the protests at Standing Rock, CBS Sacramento reports. Erin Schrode was interviewing a protester at Standing Rock. 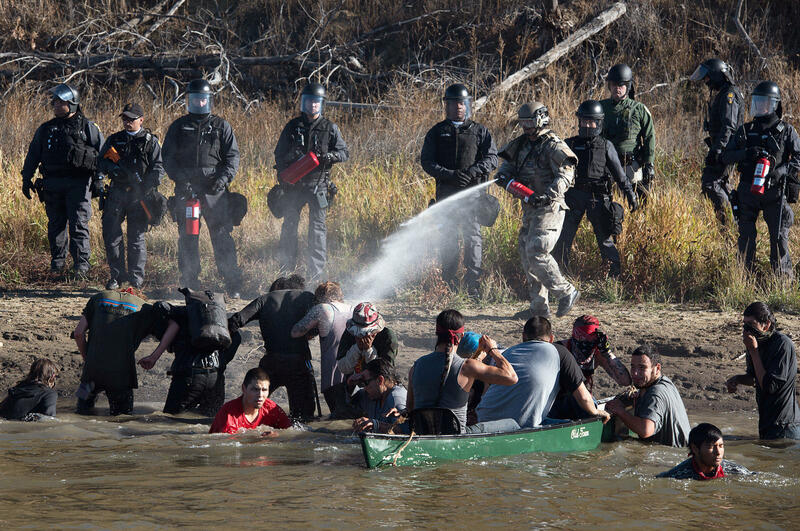 A line of police in riot gear can be seen standing across the water from where Schrode was doing her interview. Suddenly, a pop can be heard in the video and Schrode falls to the ground. It is unclear where the shot came from. Schrode later wrote a Facebook post describing the incident in detail. Members of the Standing Rock Sioux have demonstrated against the Dakota Access Pipeline for months, saying they fear it could harm drinking water and construction could damage sacred sites. Hundreds of clergy of various faiths joined protests Thursday against the Dakota Access oil pipeline in southern North Dakota, singing hymns, marching and ceremonially burning a copy of a 600-year-old document. The interfaith event was organized to draw attention to the concerns of the Standing Rock Sioux and push elected officials to call for a halt to construction of the $3.8 billion pipeline that’s to carry North Dakota oil through South Dakota and Iowa to a shipping point in Illinois. The tribe believes the pipeline that will skirt its reservation threatens its drinking water and cultural sites. Later Thursday, there were14 confirmed arrests following this incident at the state capitol, CBS affiliate KXMB reports. The state capitol was put on lockdown as a precaution due to what the Highway Patrols calls “unforeseen protest related activities.” Around fourteen people formed a circle inside the judicial wing, singing and praying.